Marie Kondo at Work: Can Your Office 'Spark Joy'? Kondo’s rules of tidying can seem a bit unorthodox: Tidy all at once even if it means persevering over a few months, rather than starting and stopping because you’ll run out of steam. Aim for perfection this one time in life; don’t clean half-heartedly. Tidy up by category in this order: clothes, books, papers, miscellaneous items and mementos. If you start with mementos you’ll get caught up in reminiscing and never finish. Hold each item and keep only those that make you happy. When discarding, thank the items for their service and then let them go. But it’s more than just physical mess one could tidy up. Also focus on the digital stuff that accumulates — the hundreds of emails at work, for example, that have grown wildly out of control. “Your creativity and productivity are significantly impacted by visible clutter in your physical work environment — and equally so — by the degree of disorganization in your email inbox and the number of apps on your smartphone,” said Erin Owen, executive coach in the Wharton Executive Coaching and Feedback Program. “You can reduce your stress level, improve your mental focus, and reduce the time it takes you to find what you need by removing, recycling, shredding or donating old books, files, papers, and even deleting lesser used apps and removing old digital files to an external hard drive,” Owen continued. The workspace of her firm, Contemporary Architecture Practice with offices in New York and Shanghai, was designed to convey a sense of serenity. 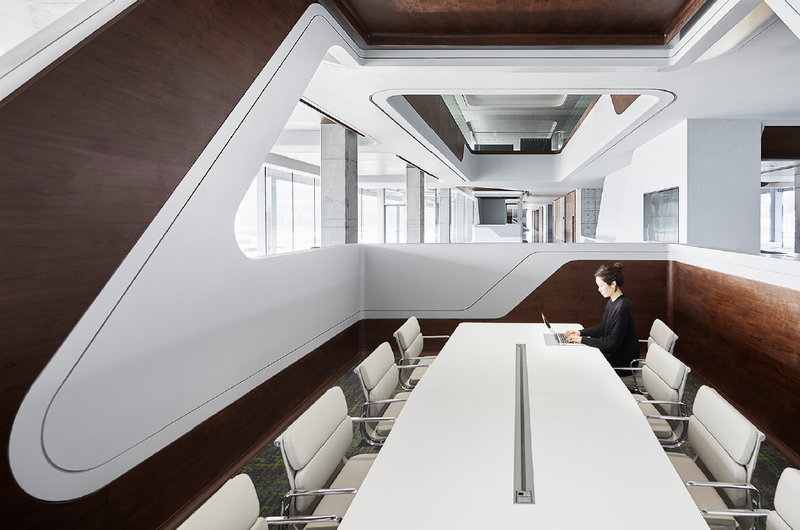 Not only is the office a soothing white, Jamelle said, the wall of a long entry corridor is designed to catch ripples of light. It opens to a space where employees share a large table in a central location, with their computers facing one another. All other stuff is behind minimalist cabinets that are part of the decor — music system, servers, filing systems, product library and so on. “I can say it does spark joy when I open it,” she said. Contemporary Architecture Practice’s New York headquarters. A workspace can be designed to meet specific needs of the firm as well. For example, a hierarchical company might wish to flatten the organizational structure somewhat and encourage employees to work more closely together. 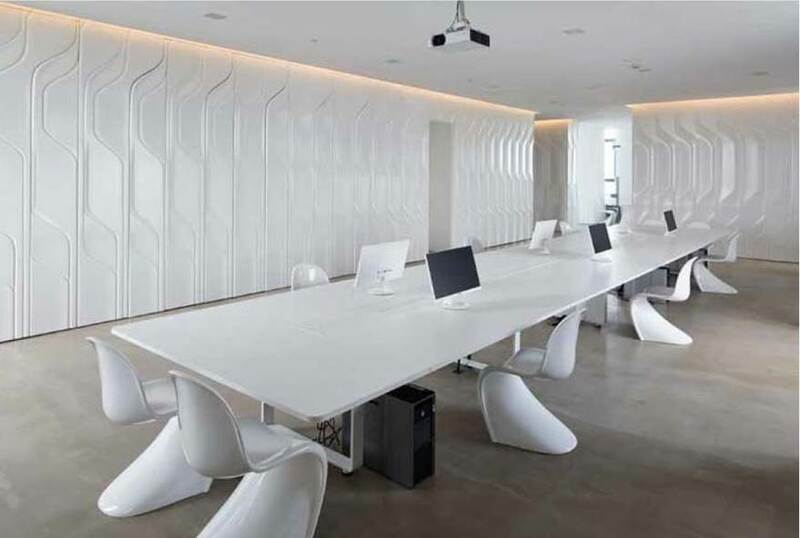 Jamelle cited the case of a corporate client in Nanjing, China that requested a workspace design to “inspire teamwork, collaboration and productivity” among its more than 3,000 employees. The resulting design comprised a series of large spaces, airy meeting rooms, plush seating, benches and other aesthetics. A workspace that Hina Jamelle’s firm designed for a client in Nanjing, China. For instance, the time spent to declutter does cut into productivity, said Barsade, citing the work of Eric Abrahamson at the Columbia Business School. In a paper on disorganization theory, Abrahamson wrote that some messes are tolerated for a time because it is actually more productive than having to put things away immediately. For example, it might be better to endure a small mess of papers for a current project on one’s desk instead of constantly putting them away and bringing them out again. They’ll be put away once the project is finished. Messiness brings other benefits, too. “Messes enhance creativity [by making] it possible to retain radically new entities that do not fit into the existing ordering scheme,” Abrahamson wrote. Messes tend to “juxtapose entities belonging to different categories, bringing to mind new combinations of entities that would have been hidden” if they were filed neatly into their own categories. For instance, he said, companies that mingle departments have a better likelihood of coming up with cross-functional ideas. Another research paper that looked at clutter in the home shows that it affected women differently than men. “For women, having what they perceived as a cluttered home did correlate with stress and depressed mood,” Barsade said, citing the paper, “No Place Like Home: Home Tours Correlate With Daily Patterns of Mood and Cortisol,” by University of Southern California’s Darby Saxbe and Rena Repetti of the University of California, Los Angeles. The study followed 30 middle-class, big-city and dual-income couples with young children for one week, to see if messiness increased stress and led to a depressed mood. What they found: Women who came home to clutter and unfinished home projects experienced more stress, which is linked with negative health outcomes. Moreover, women who saw their homes as a source of more demands showed “greater increases in depressed mood across the day, consistent with greater fatigue in the evening.” That means they had a tougher time relaxing after work. In contrast, the results for husbands were “largely null” — not reliably leading to more stress or a depressed mood. Why? Results “suggest that women may be more sensitive to the home environment or may feel a greater sense of responsibility for the home (for example, feeling guilty about clutter),” the paper said. These findings back up other research showing that the home is traditionally viewed as a woman’s “domain and ultimate responsibility” even for couples where both are employed. So a home free from clutter and unfinished projects does result in a more restful environment for women, which has positive implications for their health, the authors concluded. The home environment is important to their well-being and “psychosocial functioning,” and in turn, this well-being could translate to a woman’s “perception or maintenance of a pleasant home environment,” according to Saxbe and Repetti’s paper. As more companies adopt an open-space design philosophy to encourage more conversation and collaboration -- along with cost savings -- some question whether the resulting loss of privacy and frequent interruptions could end up hurting productivity. A new book says focusing intensely without distractions on a cognitively demanding task leads to peak productivity.